Transitioning from renting to owning a home can be a daunting task. There are all sorts of new experiences and responsibilities that you probably aren’t familiar with. The maintenance of an apartment can be rather easy for the renter. If there is a problem, you call the maintenance technician or the front desk and someone comes and fixes whatever the problem is. Now, this process might not always be fast or painless, but it usually is included in your rental cost and it doesn’t require you to actually “look into” or fix anything. It’s a pretty good deal. Once you become a homeowner, these things change. If you are not very handy and have no interest in learning how to fix things on your own, one of the first things you need to find is a number to a good handyman. For many issues in the home, the handyman can serve as an electrician, plumber, carpenter, etc. Usually, this is much cheaper than calling a professional company that only handles one type of issue. If the problem is too severe, the handyman will make a recommendation to call a professional. Besides getting these little nuances in the home fixed, it’s also important to keep track of it. That is where the Home Maintenance Log comes in. Previously, we created a Seasonal Home Maintenance Schedule for our Home Management Binder that would help keep the home in tip-top shape. Today, we are going to show you the basics of creating a Home Maintenance Log to track all of the changes and updates made within the home. 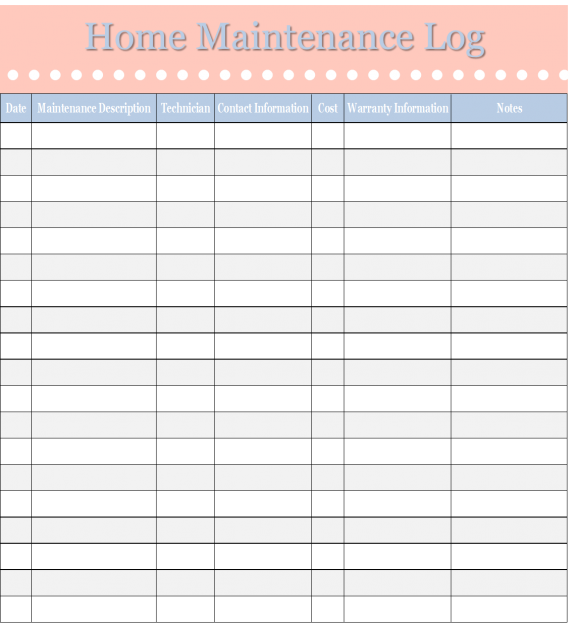 Below is our Home Maintenance Log template that fits perfectly with the other items in the Home Management Binder.